Mango pudding is a favorite dessert served in many Chinese restaurants. 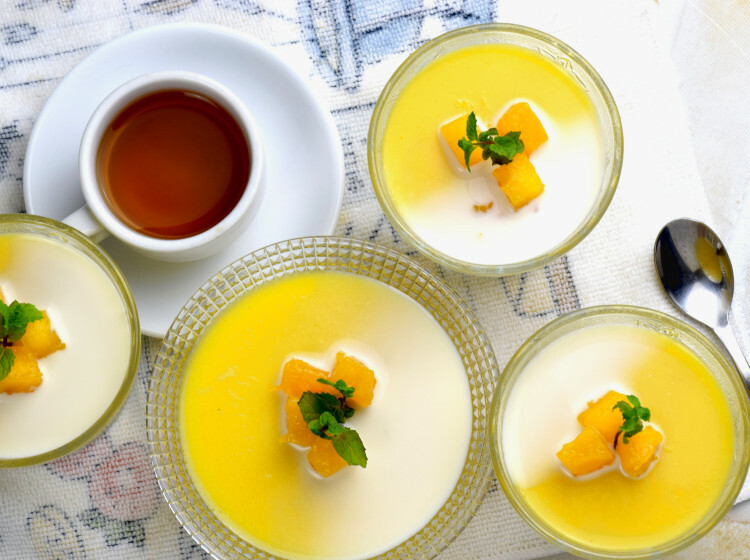 Read on to find out how do I make my version of Dim Sum style Mango Pudding in this article. I ordered a few mango puddings at different local restaurants before deciding to give it a try. Every one of them has its uniqueness. I would like to sum up those good ones are all share a set of criteria – the texture of the just-set gelatin, light as a feather, full of mango flavor and melt-in-the-mouth. This set of criteria immediately turns an easy recipe to become a daunting task. So I carry out a series of test this week to find the best ratio of ingredients required, the right type of mango, the amount of gelatin to form the ideal texture, and the techniques to make it smooth and silky. 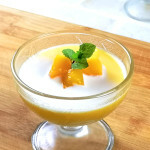 I hope this article is useful for you if you are planning to make a good quality Hong Kong style Mango Pudding. Let’s dive in and take a look at the step-by-step instruction. A strong mango flavor in the pudding without artificial flavoring agent). Tender and soft, firm enough to hold its shape but breaks when poking with a spoon. Choose the best mango for the mango pudding. 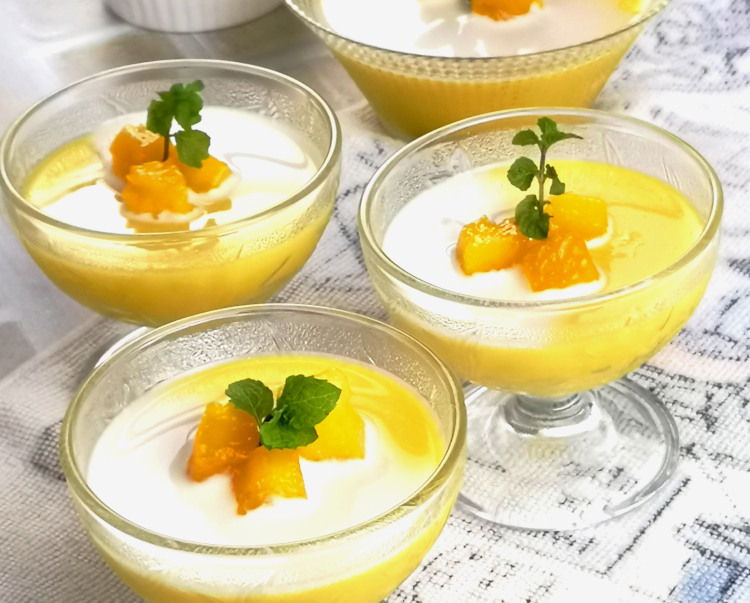 This mango pudding should be bursting with luscious mango flavor with no artificial flavor in it. As such, I tried a few mangoes species (dragon, Falan, R2E2, and Folgen Water Lily Mango) and eventually decided to use the Dragon Mongo from Thailand. You may want to choose from the species of mango available at where you are. Certainly, it will be likely different from what I used. However, the following guideline applies. Choose the mango that is sweet. Get the assistance from the shop assistant to suggest one. The mango should be slightly past ripe. The skin may have some black speck, and might feel somewhat soft when touch, but not mushy. It may have a little sticky sap leaking on the surface. It may not be the best appearance, but it produces the sweetest puree. 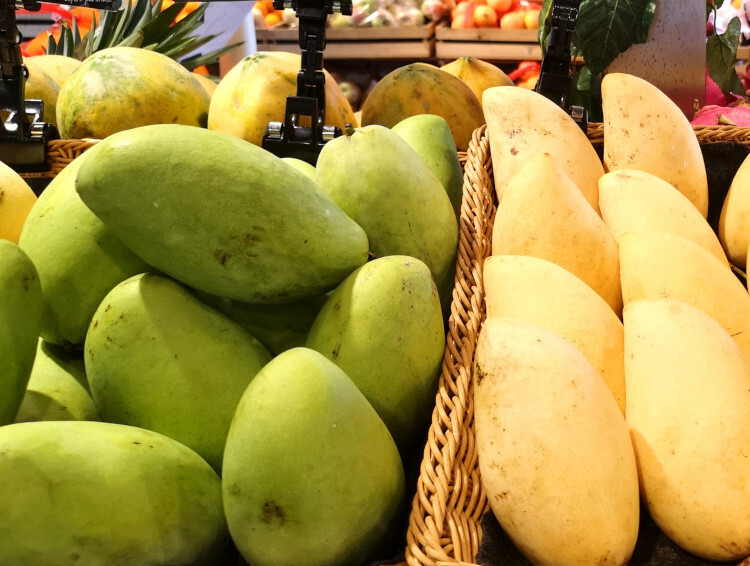 Ask the shop assistant to suggest for the type of mango that is less fiber. We want the pudding to be smooth and creamy, free from any fiber if possible. If it is not the mango season and you want to enjoy the pudding, you can use the frozen mango or the canned mango cubes. Certainly, the flavor will not be as good as the fresh and ripe mangoes. Since the entire process of making the pudding does not involve in boiling the ingredients, it is crucial to keep the utensils clean. The pudding will turn moldy much sooner if the utensil is contaminated. Therefore, I suggest using hot water to rinse all the bowls before making the pudding. Cut the mango into two large slices, leaving the pith at the center. Use a knife to cut criss-cross on the flesh to make some dices. Keep aside. Remove the remaining flesh from the skin and the pith. The easiest way to remove the flesh is to scrape the flesh from the skin and the pith with a metal spoon. Place the flesh in a food processor or blender. Add some water and blend the mango to form a smooth puree. Blending the mango flesh with water can produce a smoother puree then blending the flesh alone. Pour the pureed mango through a fine sieve or wire mesh strainer. Use the back of a metal spoon to press the puree against the strainer so that the puree will pass through the sieve/strainer. The sieving process will remove most of the fiber of the mango. This step in essential to ensure the pudding has a smooth texture. Add the cream and milk to the puree. This step is quite similar to how I make the Pandan pannacotta in our restaurant. Stir it and pour the mixture into the food processor. The amount of milk and sugar can be varied. If you prefer a less creamy texture, reduce the amount of cream and substitute with milk or water. I have reduced the amount of cream as I find that the original prototype is too heavy on me. Dissolve the gelatin. Add the gelatin sheet (or powder) to cold water. If you add the gelatin directly to hot water, it will easily form lumps. Give it a few stirs. Let it sits for three to five minutes to allow it to bloom or hydrate. There should not have any noticeable lumps by now. Now add the sugar into the bloomed gelatin. The amount of sugar in this recipe is towards the sweeter side. Reduce the amount if you prefer a less sweet version. Heat it slowly to dissolve the sugar. Since the gelatin will dissolve above 37°C, it will dissolve first when the temperature increases and the sugar will dissolve subsequently at a higher temperature. Once the sugar is dissolved, remove from heat. Do not heat up to near boiling point as boiling can destroy the ability of gelatin to set. The Bloom value measures the ability of the gelatin to set. Generally, most of the available gelatin has a Bloom value between 30 to 300. I am using the gelatin powder with 200 Bloom in this recipe. Since you may not use the identical gelatin that I use, the amount in the recipe is only for your reference. If you are using the gelatin with the 200 Bloom too, chances are you will more or less get the just-set texture. If not, you may need to make some trial and error test batches for the best result. The amount of gelatin required also depends on how firm you want the pudding to be. I use 2% of gelatin for this recipe for a softer pudding. This means 2g of gelatin for every 100g of ALL the ingredients combined. I am looking for a barely set pudding with an alluring wobble texture when you shake it, but yet firm enough to let the mango cubes stud in it. Use 3% if you want to make a firm pudding. Bear in mind that mango has protease, an enzyme that can destroy the setting ability of gelatin. You may that a slightly higher percentage of gelatin is required as compared to other fruit puddings to achieve the same hardness. Pour the gelatin/sugar mixture slowly into the mango puree mixture. Keep stirring but not too vigorous to avoid creating too many bubbles. Once the mixture is well combined, pour it through the strainer for the second time. Why do I want to strain it for the second time? First, it will remove any lumps of gelatin (if any) and catch any fiber that might seep through the first round of straining. Secondly, it breaks the bubbles (if any) so that the final mixture has a clean and shining surface. Fill up the molds with the mixture. Use the tip of a folded kitchen tissue to break the bubbles, if there are. Cover with cling film and chill for at least two hours or until the pudding is set. Before you serve, add a small amount of evaporated milk just enough to form a thin layer to cover the surface of the pudding. You can also use coconut milk to replace the milk for a change. Add more mango cubes on the surface. Decorate with fresh mint leaves. 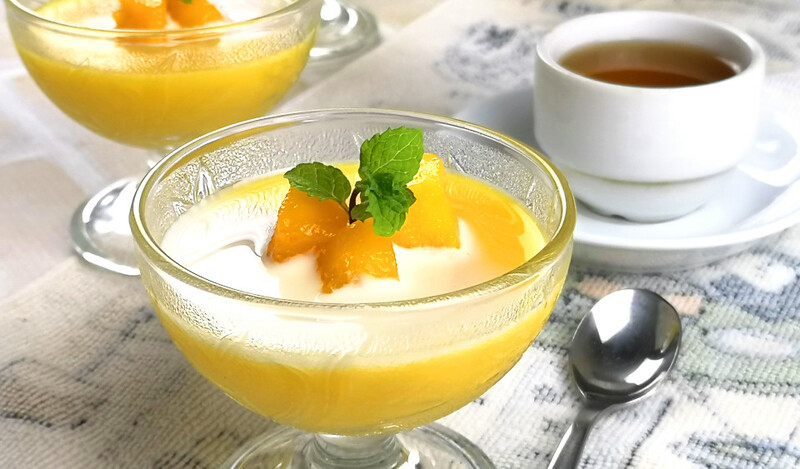 This recipe is the Chinese style mango pudding popular in Dim Sum store. Cut the mango into the half. Use a knife to cut criss-cross on the flesh to make some dices. Keep it for the subsequent step. Remove the remaining flesh from the skin and the pit. Place the mango flesh in the blender. Add the water as in the recipe. Blend the mango until it becomes a smooth puree. Pour the pureed mango through a wire mesh strainer. Use the back of a metal spoon to press and stir lightly so that the puree will pass through the strainer. Add the cream and milk to the puree. Put cold water in a small pan. Dissolve the gelatin in the cold water. Let it sits for five minutes to allow it to bloom. Now add the sugar into the Bloomed gelatin. Heat it slowly until the sugar dissolved. Remove from heat. Pour the gelatin mixture slowly into the mango puree mixture. Pour it through the strainer for the second time. Place some mango cubes in the cup. Use the tip of a folded kitchen tissue to break the bubbles. Add a teaspoon of milk (or coconut milk) on the pudding. Decorate with more mango cubes and mint leaves. 1 Response to "Mango Pudding – How to make in 3 simple steps"